What short travel 29er trail bike? This topic has 60 replies, 41 voices, and was last updated 2 months ago by chakaping. I’ve recently sold my Chameleon and want something with a bit of bounce in the rear. I live in Tunbridge Wells so bar the odd trip to Sheffield and Wales, most of my riding is either Bedgebury or the SDW. I’ve always got on better with full sussers so I’m looking at the shorter travel end of the market. Have given some serious thought to a Stage 4, however the lack of waterbottle mounts is a bit off putting (I don’t like riding with a pack). Also their full builds are a joke price wise but I’m happy to build it up myself. Other options are an alloy tallboy, built up similar to a stage 4, or maybe a Fuel EX 8 which comes in a fair bit cheaper. I’ve got a budget up to about 3.5k, I’d prefer 29er and don’t really need anything over 130mm of travel. I’m also not really into the long/low side of things, tried a Cotic and it just felt a bit much for where I live (although ideal for the peaks). Might be worthwhile throwing your leg over a 29er Stumpjumper ST. The Fuel is a bloody good 29″ trail bike IMO. But I would try one for sure, as they are a bit lower and slacker than Trek advertise. I still really like mine, now it’s back in its light weight trail bike setup, it’s just a really good MTB. Which Cotic did you try? The FlareMax was a hoot in the Surrey Hills. If I was in your shoes I’d be having a very goods look at the new 29 Giant Trance. I have the no not available 650b Anthem with 130mm forks and find it a perfect trail bike for similar riding that you describe and I think the new Trance is just a grown up version of it. I rally enjoy my alloy Transition Smuggler. What about the 120mm forked version of the Canyon Lux – takes two water bottles. So many fantastic choices here. Scott Spark has to be on your list as well…. The Merida 120 too. Me? I love my Evil Following MB. I really recommend demoing them though. Some bikes I thought I’d love didn’t connect when I actually rode them, others were a very pleasant surprise. They all feel different. I much prefer my longshot flaremax to the smuggler I had before. But if you found the cotic too long then the smuggler might be ideal for you. It’s a great bike and at least the previous versions weren’t as extreme 8n terms of length as many of the newer offerings. I had a 26” trance back in the day, which was a great XC/trail bike. The new 29er does indeed look great, but I think it’s getting as long and slack as all the others now. Evil Following v1 – fantastic short travel XC and trail bike. Just ordered a Marin Rift Zone 3. It’s ‘only’ 2k but with a wheel upgrade it should be all the bike I need. I also considered a Cannondale Habit and Giant Trance 29 but the Marin got great reviews and looked better value. I’ve got a alu smuggler, it’s a little heavy with poor rear tyre clearance but it’s good fun. The lack of bottle cage mounts is, your quite right, annoying, but I’m putting up with it (back bottles are a good solution). However I am super pleased with my Stage 4, which I built up considerably cheaper than Oranges off the peg bikes. I’ve got Fox Performance Series 34s with the Grip Damper, GX 1×11, Hope brakes, Mavic Trail Elite wheels etc. I love it. My size Large frame fits me just right with a 125mm dropper, and is reasonably long in the TT without being quite Cotic long. A Flaremax would have been my other favourite contender but the Orange was a lot cheaper with a Fox Shock. I recently bought a complete 2017 SC Tallboy C from my LBS for roughly 2,500 GBP. Its a mk3 so has the current geometry but has the 2017 color scheme so a bargain to be had. Even after upgrading the forks to MRP Ribbon Air (set to 130mm) and Flow Mk3 wheels it still falls under your 3.5k target. Its an absolute blast, so much so I’m considering selling my Firebird as it now hardly gets ridden. Intense primer or sniper worth a look. Have demo’d the primer and a mate has one – goes like a scalded cat for a bike with that much travel, up and down. 2 mates have Primers and love them. 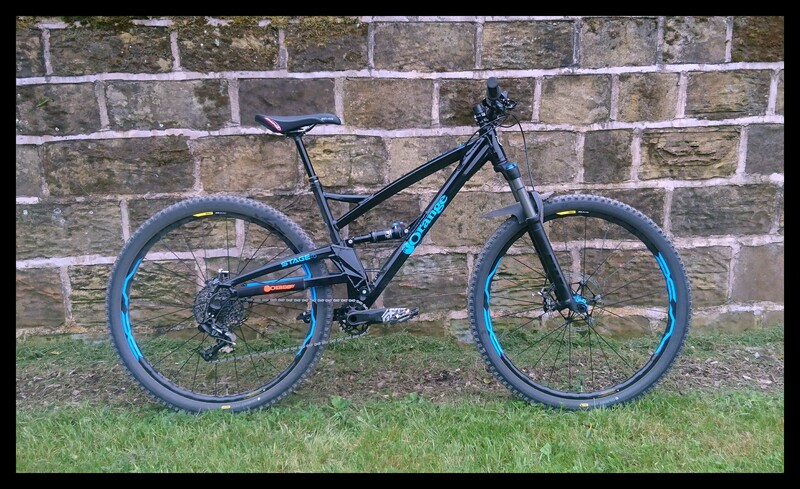 I have an Orbea Occam 29er which is 120 rear, 130 front – great bike and light. Tallboy 3 would get my vote – some great deals about, perhaps because a new Tallboy/Hightower might be on the way this year. They are a lot of fun. I’m tempted by one of them rift zone 3s too. They’re on £1500 from Pauls. That’s mental. Thanks for all the suggestions folks, much appreciated. I’ve considered the Smuggler but it sounds like weight could be a bit of an issue? I want to do the SDW in a day and I’d be wary of something heavy and draggy – of course this said I want to ride it in wales and the peaks too, so basically I’m looking at ‘moon on a stick’ type stuff. I do really want a Stage 4, it’s just the lack of bottle that puts me off. And obviously I like Santa Cruz because…well, because it’s a Santa Cruz so still considering a Tall boy. Snotrag – can I ask how tall you are? I sat on a large Stage 6 and it felt pretty long (I’m 6’2 with long arms and legs). Hadn’t considered an intense – will mooch over to their website now and have a look. I want to do the SDW in a day and I’d be wary of something heavy and draggy – of course this said I want to ride it in wales and the peaks too, so basically I’m looking at ‘moon on a stick’ type stuff. Nope. Carbon Tallboy, Intense Primer, Orbea Occam will all do both types of riding. Modern bikes are great. Smuggler isn’t what you’re after, not a good enough pedaler. If not the stage 4 then probably something carbon like the intense. Or the new Trance as suggested above. Not ridden one but it looks very Smuggler-esque geo-wise. Definitely worth a demo on an intense – even the primer pedals and climbs like a rocket, despite being pretty handy downhill. (Think one of their mechanics does easier enduros on one at times). Lot of bike for the money now they are direct sale. And no I don’t work for/with them!! In fact, forget the rest just get the Whyte…. Scott spark may be worth a look, good angles, reasonable weight. Thread on here a few days ago about them. I got my Marin Rift Zone 3 2019 from Biketart sale about month ago and it’s bloody a lot of bike for £1600. So far changed tyres to minions and got longer dropper post and still under £1800. I have clocked 200miles around Cannock Chase in a month and love it. If I had 3.5k budget I would probably get Santa Cruz tho. Whyte S120 is a good shout. Mine pedals great, I love riding it. One of my mates loves his Intense Primer – his other bikes are a 26” Ti Slackline (which he now finds annoyingly slow) and a Nomad 3 (which now only comes out for gnarly days). Seems quick up and down and along (on the South Downs as well as elsewhere) and I’ve seen him send the Motherhucker drop in the Surrey Hills which is a good 10’ odd vertical. Lots of great bikes in the short travel 29er category for that budget. Trek Fuel. Scott Spark. Giant Trance. Transition Smuggler. Stumpy ST. Pivot Trail 429. Ibis Ripley LS. Yeti SB4.5? Now discontinued by Yeti so some deals around for C series builds or T series frames. 114mm rear / 140mm front. I like mine. A very versatile bike that’s equally as comfortable dispatching xc rides as well as riding more challenging terrain. I’ve a Smuggler, built up carefully for about £2k all in. It’s certainly not heavy and it pedals just fine. Also goes downhill very well. Recently got a trek ex.130 travel. Slightly related, orange Segment ? Love my factory edition and drakes cycles in leeds have one in your size for 2900. Hope bits, kashima fox bits and sram x01 and ultimate brakes. Smuggler pedals fine, the Orange on the other hand is terrible. Had plenty of big days out on the smuggler (5000ft, 30miles). I’d bin the monarch shock that comes on it and stick a double barrel IL on it, monarch holds the bike back. My Smuggler pedals just fine round Bedgebury.